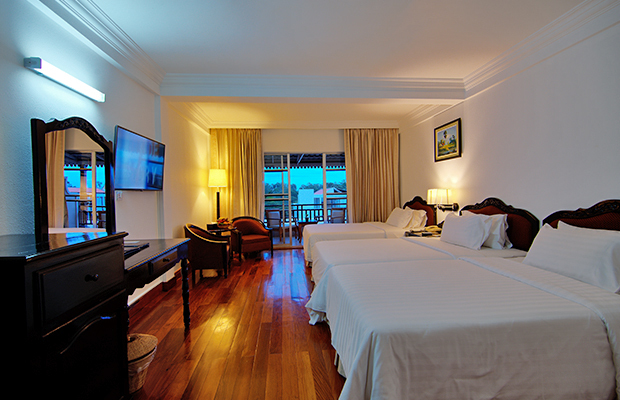 The superior triple room features a panoramic view of Siem Reap city and is furnished with wooden flooring, private balcony, separate bathtub and shower cubicle, smoke detector, and in-room emergency exit floor plan. - Room Rates are quoted nightly in US Dollar. - Room Rates are included service charge and government tax. - Promotion Rates require a minimum of 3-night stay. - Room rates and benefit offers above are entitled for 02 persons only. - Steam, sauna and Jacuzzi are additional charge at Bayon Spa & Health Club. - One child under 4 years stays free of charge when using existing beds. - One child under 2 years stays free of charge in a child's cot or crib. - One child older than 11 years old or adult is charged USD 50 per person per night. - An extra bed include package offer. - The maximum number of extra bed/children's cots permitted only one per room. - Accept Visa,Master and JCB Cards. 100 percent of the first night will be charged. reserves the right to pre-authorise your card prior to arrival. Remark: Free Airport pickup from Siem Reap International Airport to Hotel( From 6:00am -10:00pm ) please advise full flight number and time arrival. Over times from 10:00pm at night–6:00am the morning, we will charge 11USD/way for 3 Pax and Mini Van 16 USD/way.